For four days only, and for the first time since opening 10 years ago, the legendary Bompas and Parr opened their studio doors for a behind-the-scenes tour called Temple of the Tongue. On Monday the Mask team were lucky enough to get a sneak peek in the south London workspace of this incredibly creative team. Temple of the Tongue was designed for a few reasons, mainly to complement Tongue Town which is currently exhibiting at the Sao Paulo Museum of Modern Art. It’s also part of the London Festival of Architecture, which the duo took part in back in 2008 and made the Architectural Jelly Banquet. Temple of the Tongue is an explorative audio tour for guests to understand the journey from crazy concepts, which go beyond the kitchen, to create fully immersive experiential events. 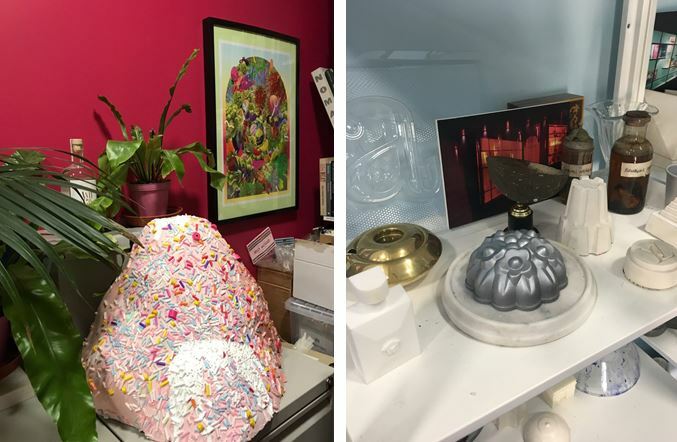 Filled with curios and past event props, the Bompas andParr studios are an Aladdin’s cave that you could explore and ponder over for days. Before we got started we had palate profiles, where we had to guess what we were tasting. Slightly embarrassingly our palates aren’t so experienced and it took a lot of head scratching before we realised what we could taste. Reassuringly most people do not have an experienced palate, so we didn’t feel too bad. Bompas and Parr are firm believers of creating a taste sensation but don’t get hung up on being Michelin star chefs – they want to evoke all five senses (especially sight). We began our expedition in the Jellobarium, which was filled with original jelly moulds used in the jelly banquet, alongside the Wheelchair of Death and Pill Press! The audio tour meant we could pause tracks and go off for a snoop around, whilst trying not to disturb Bompas and Parr employees going about their everyday magical business. We explored the Chamber of Reflection and the kitchens, with the Flavour Conductor (a musical organ created for Johnnie Walker to reinvigorate whisky drinkers) taking pride of place. 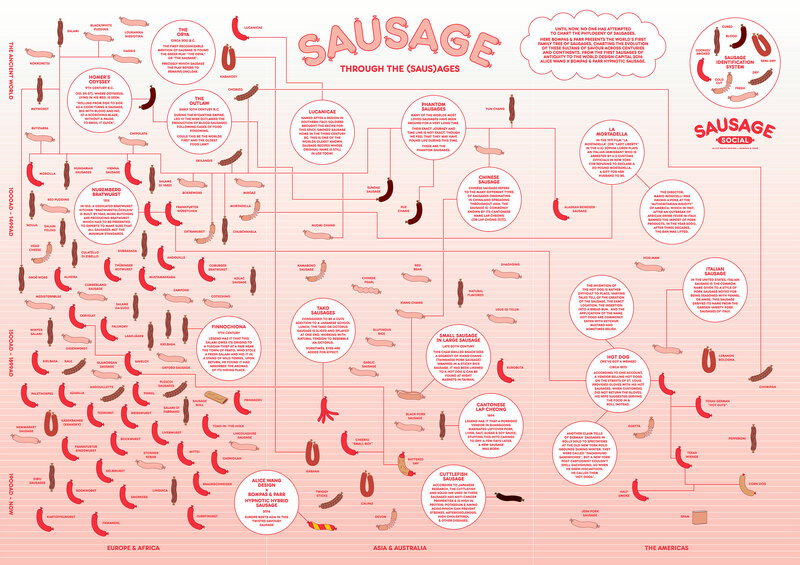 We particularly enjoyed the Sausage Through the (Saus)ages, which showed how sausages were popular over the years and across the world. Everyone loves a sausage! It’s not just cumberlands, wurst and chorizo, you know. The library was packed to the rafters with inspirational reading material (The Encyclopaedia of Pyschoactive Plants, anyone?) as well as the more expected (Heston’s Fantastical Feasts). Prints, posters, paintings and photographs adorned every wall, with mementos and memorabilia filling every surface. Lastly we were guided through to the workshop where we had a go at making our very own jelly moulds using a school vacuum press, and sampled some elderflower and grape jelly. 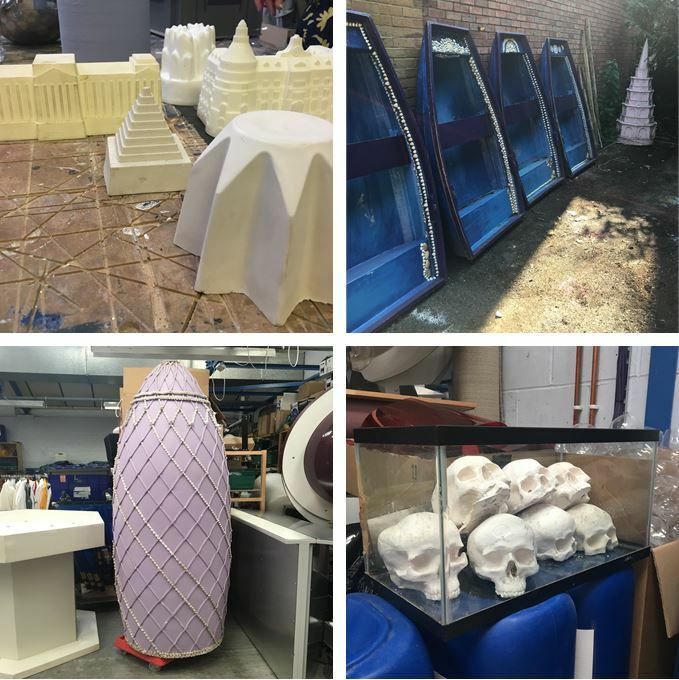 The workshop and adjoining courtyard were filled with larger props – boats used at the Kew Garden fruit-themed boating lake, a ginormous speaker, a 6ft+ Gherkin (the building, not the vegetable – although anything seems likely here) and a tank full of skulls. Our whirlwind tour was a little confusing, very intriguing, and just enough to keep us wanting more. So we wish Bompas and Parr a very happy 10th birthday this week, and hope they have another decade of success. Did you get tickets to see their studio? Let us know what you thought!